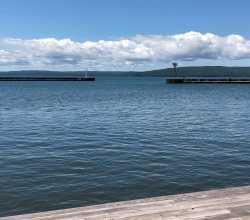 Mella’s Cottage is conveniently located steps away from the Madeline Island Marina and walking distance to the Madeline Island Golf Club and downtown La Pointe. Mella's Cottage is perfect for two people, two couples or can accommodate up to six guests. The open floor plan is inviting and Mella's features a very private screen porch and deck. The main living area features an open architecture plan with the kitchen opening up into a vaulted cathedral ceiling living room. A wonderful private screen porch is perfect for enjoying the peace and quiet of the outdoors. Cozy up to the fireplace in the spring or fall; or, enjoy the comfort of central air during the summer. Very clean interior. Was a bonus that linens, towels, and paper products were provided, and that towels were changed mid stay. Ron was our main contact person who was efficient, informative, and personable! The stay was absolutely delightful! We felt like it was home and didn't want to leave.